Service Location: St. Timothy Catholic Church 1730 W Guadalupe Rd. The family of Victoria Ann Serna is saddened to announce her journey to Heaven. She stayed with us until July 22nd, 2016. She was loved by so many people and she returned that love and affection to everyone who was fortunate enough to be blessed by her presence. 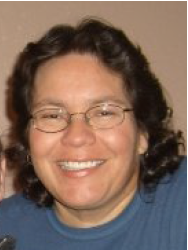 Vicki (Kiki) was born on March 3rd, 1962 in the small mining community of Morenci, AZ. She attended Morenci schools and graduated from Morenci High School in 1980. She participated in many school activities such as marching and concert band. She was a member of the tennis team. She received most of her sacraments from Holy Cross Catholic Church in Morenci. After graduation, she moved to Mesa to continue her education at Mesa Community College and Arizona State University. She was employed in local print medias, including the PennySaver, East Valley Tribune, Clipper Marketplace and at Tucson Local Media until the time of her death. Vicki was loved by hundreds of co-workers. Vicki loved her faith, her family and friends and her dog, Theo. She was an excellent cook. We loved her surprise dishes at family gatherings and football Sundays. She loved movies, but just the funny ones that made her laugh. Forget the tear-jerkers. Bruce Springsteen and the E Street Band was her favorite rock group, though she loved all types of music. She never missed the Boss when he played in town. She attended his most recent concert in March of this year with some dear friends. She loved to play card games with anyone willing to compete against her, mostly her little nephews and nieces. She was funny and witty and always ready to exchange jokes and riddles. Vicki was part of a “bigger than life” family. She was preceded in death by her parents, Reyes and Julieta Serna. She is survived by her brother, Larry Serna and her sisters, Patricia Hernandez and Christine (Bud) Corn. She was loved by numerous nieces and nephews, cousins, aunts and uncles and their families. Her friends numbered in the hundreds. We will miss her so much but we will be better people in this life because she so lovingly touched ours. Her life will be celebrated with a visitation on Thursday, August 4th, 2016 from 6-8 pm, at Bunker’s Garden Chapel, 33 N. Centennial Way, Mesa, and a funeral mass on Friday, August 5th, 2016 at 9:30 am, at St. Timothy Catholic Church, 1730 W Guadalupe Rd., Mesa. Burial will follow on Saturday, August 6th at 10:00 am at Sacred Heart Catholic Cemetery in Morenci/Clifton. Arrangements entrusted to Bunker Family of Mesa. Her family encourages donations in her name to the National Stroke Association, 9707 Easter Lane, Suite B, Centennial, CO 80112.